Backup all of your game saves in just a couple clicks. Restore games you have previously backed up, even if you change computers or operating systems. You can even share your saves with friends. Support for saving and restoring over the network (UNC) and saving to cloud services, likeDropBox and SugarSync. Currently detecting over 1,200 games. All application settings are stored in the application's folder. This makes SGB.net great for thumb drives. Contains complete out-of-the-box language support for English, Dutch, French, German, Russian, Spanish, and Slovenian languages. New languages can be added at your discretion. Using SQLite to manage all asset information. SQLite's unparalleled speed makes it the best choice for SGB.net. Ability to update database from within the program to keep up to date with the latest database. There is no need (usually) to update the entire program to get new game support. Custom database entries: if a game is not supported, you can add it yourself. This means SGB.net can be used to back up a lot more than game saves. If you don't want to see a game on your list anymore, you can hide it with the Ignore List. Using DotNetZip for standardized zip compression to keep backup archives as small as possible. If you have a multi-core system, DotNetZip will take advantage of it, making it's speeds unmatchable by similar libraries. The created archives are not password protected, so they can be viewed/edited with any archive manager. All restoration information is stored in the comment section of the zip file. 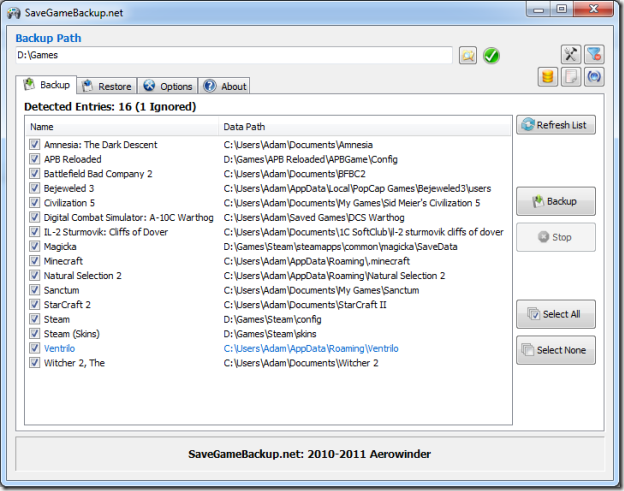 SaveGamebackup automatically detects supported games from the computers directories. To save a backup, pick the installed games from the list and Click Backup. To restore your game progress, go to the Restore tab and load the saved backup file from the source folder. The Options tab can be used to set a detection criteria (such as detection from custom database, standard database, applications, flash, steam cache and steam cloud) and to ensure that old game backups are not overwritten. You can also hide entries you don't want to see anymore by adding games to the ignore list.